Congratulations on your little baby girl!!! That’s so exciting! I am so happy for you hon and yay! A girl! So exciting! I know it really felt a lot more real to me once we found out we were having a boy. I know too well how hard it is to not worry but it does get easier with each milestone you reach and this is a huge milestone! And I hear you on the “is this your first?” question. It’s so hard. I tend to read the situation and decide if I want to tell people everything, but sometimes it just doesn’t feel right and i think that’s okay. Hugs hon. Congrats on your baby girl! Thank you so much:) It helps to know I am not the only one! 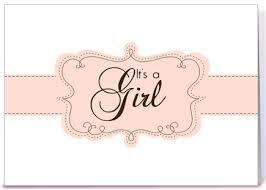 Congratulations on a baby girl!!! Baby girl! Congratulations! The “Is this your first” question is so hard. So, so hard. I still pause every time I get that question before I respond. To some, I am honest, but to most I just say “yes” because I don’t want to explain. But if it feels right to share and you want to sometimes, I say go for it. I have yet to have an unpleasant reaction from anyone. So very happy for you and I hope you can enjoy it more and more every day.